Game development is an iterative process, and while this does grant you a good amount of freedom to experiment with new ideas. How much time you devote to each iteration is extremely important since each one inevitably costs you development time, so separating ideas that work from ones that don't quickly becomes paramount. Obviously you won't always know that what you're attempting is in fact a poor decision until you test it out, and there's no shame in that; sometimes things simply aren't as fun as you imagined they would be. More importantly just because the concept is bad in the current game you're working on doesn't always mean its a bad idea in general so you can keep it around until you find a better place for it later. Where there is a serious issue though, is when you've convinced yourself certain aspects of the game must work no matter what. What is important isn't whether or not you personally like the concept, but rather: 1. Whether the concept works in the first place. 2. Does it play well with the game thematically and in tone. 3. Finally whether other people agree that the mechanic is fun within the scope of the game. The final one is one of the parts that can get you into trouble, because to often people will hear feedback along the lines of "Well this thing is fun, but it doesn't feel like it fits." From that feedback the instinct might be to make sure it gets into the game period because you were told its "fun" but even then you may only end up muddying the game. For example, in the Batman Arkham series of games the combat works on what they call the Free Flow system which let players move quickly through combat as long as they maintain a combo. The longer they maintain the combo, the faster and more easily the player can move and it creates a really dynamic and most importantly fun way to deal with combat which is a large part of the game. At one time though they were going to actually have this system set to beat, and the player would need to connect blows on beats in the music. In all, it's really not a bad idea and could prove to be really interesting in another game but ultimately if it had been incorporated into the Arkham series of games the system probably would have been a little strange. The Free Flow system though, clearly evolved from that older system though and gave rise to what the series used. One of the ideas eventually put forward was the idea that she could be the "ranged Udyr", with Udyr being a character that switches between various "battle stances" to gain different effects. 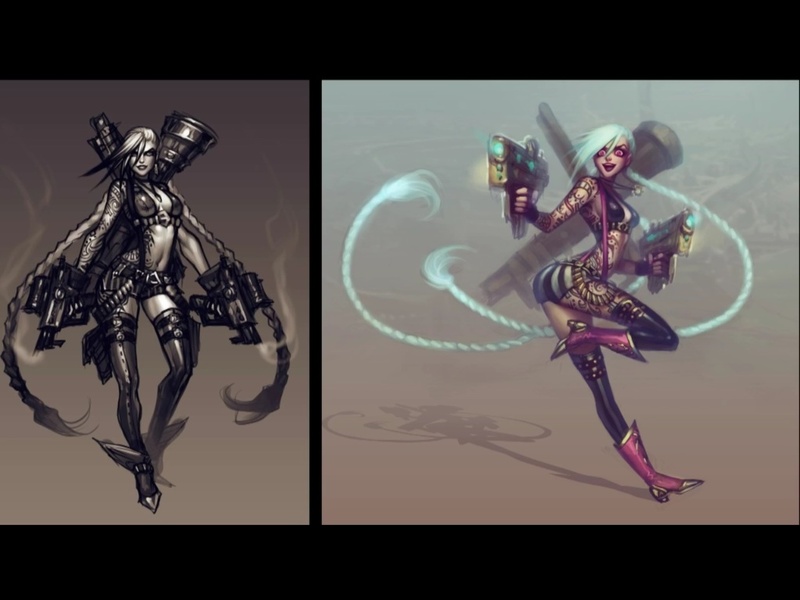 So Jinx would have been able to switch between any of her weapons at will and then use that for as long as she wanted, until she decided to switch again. Once again this isn't a bad idea but it posed a series of problems primarily with balance. It was going to be a severe issue, because it meant that she wouldn't be able to have a ton of damage necessarily on any weapon and give it status effects on top of that because Jinx would grow to be outright oppressive and since she's ranged it would be difficult to counter her. Despite how much they enjoyed the idea they eventually scrapped it, but you can still see some of the core concept in Jinx's character. She still has a whole bunch of weapons and two main weapons that she switches between. If you ever want to be a decent game developers you have to understand that not every idea you have is going to be a winner. When something does work you either need to let it go, let it evolve into something else entirely, or just set it aside for another day. I would even go so far as to say you almost never want to let an idea go entirely because you never know when it might be useful. What is most important though is that you understand that simply forcing and idea into a game just because you decided it must be there, won't work out for you in the long run.